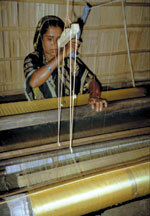 For many Bangladeshi women, the production of silk is an important source of income. In Bangladesh, most people’s livelihoods are linked to the rice harvest. When the rice is growing, or when families do not have enough to eat or sell as a result of the frequent floods or droughts in this land with many rivers, people are in danger of going hungry. But the silk worm provides an alternative. Rangpur Dinajpur Rural Service (RDRS), an associate program of the LWF/DWS, is the largest non-governmental organization in northwestern Bangladesh. It employs a large number of women in sericulture—silk production—giving them an opportunity to earn an income to support their families. The process begins in villages, where many women work together to cultivate mulberry trees. Worms are fed the mulberry leaves and raised to a cocoon stage. In 2001, a total of 15,000 mulberry plants were grown in homesteads and 40,000 cocoons were produced. Around 300 women were trained in cocoon rearing, while more continued working in the silk factories within RDRS working areas. One of these women, Fulfuli Rani, works two hours daily in the shade of the overhang of her house, a carefully crafted building made of mud and thatch roof. She pulls naturally golden strands of silk thread off cocoons in a boiling pot of water and winds them onto a reel. Rani says, "Without the silk worm production, I would have to leave the village and go somewhere else, maybe the city to earn some money for my family. Now I do not have to." While her life in this challenging part of the world is not as smooth as silk, her work brings hope to the family. "I want to improve my family and the lives of my children. I want my children to go to school and receive a proper education." Through the RDRS, Bangladeshi women will be bringing a special gift to the Assembly in Winnipeg. Silk scarves in the seven rainbow colors, and arrayed with the LWF Tenth Assembly logo, will be offered to Assembly delegates. The women’s interwoven golden silk strands are a special gift of the Lutheran communion.